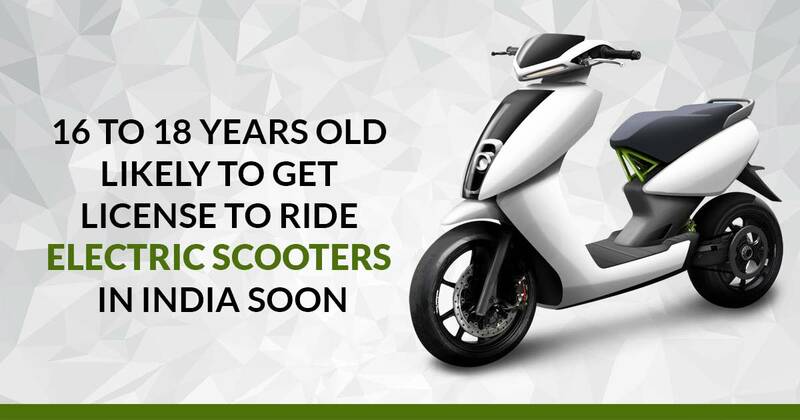 16 to 18 Years Old Likely to Get License to Ride Electric Scooters in India Soon: Read More! As per an announcement made by Union Transport Minister Nitin Gadkari, the driving licence provision for 16 to 18 years old is under government’s consideration. In future, they will be eligible for driving electric two-wheelers in India. In current provision of the Motor Vehicle Act, 1988 minors are allowed to drive a vehicle with displacement under 50cc. That’s is totally unfair to them according to Gadkari. As no such vehicle is under production in India. The driving licence for riders between 16-18 years of age will allow them to ride Electric Scooters with maximum motor output of four kW. Altogether, the allowed top speed for these EV riders will be 70kmph. This step of issuing licence for the riders under 18 years will help the government to curb rash riding being attempted by teenagers. The new provision appears more probable to sport in boosting Electric Scooters sales in India. The future of mobility-EVs. They are easy to use, recharge and maintain than other electric vehicles. As of now, the manufacturers like Okinawa, Yo bikes and Hero Electric are producing electric scooters with power output of less than 4kW. Apart from this, a proper installation of an ecosystem for electric vehicles is under study by the ruling government. That will allow registration of different green licence plate for EVs with white fonts for private cars and yellow fonts for taxis. Mr Gadkari touted, "The government has approved distinctive green licence plates for electric vehicles to encourage people to use electric vehicles". As per Gadkari, these Green plates electric vehicles will be easy to identify. Alongside, they will also get benefited with free entry in congested areas, preferential treatment in parking lots. And, a host of other benefits including discounted toll charges. As per an official, the electric vehicles count is projected to grow 5 percent of the available units across the country. That is 1 to 1.5 lakh units. The cost reduction can only boost up this count. As of now, the levy GST on batteries is 12 percent at par with the GST on EVs. the official further added, in 2017-18, overall vehicles sale were about 24 million, barely 1 percent of this count was the electric vehicles. he added, there are chances that public transport operation will be mandated to provide 1 percent incremental feet post-2020. The finance ministry will also be requested from the ministry of road transport and highways for bringing down the depreciation rate at 50 percent in contrary of 15 percent on regular vehicles.